I know it's only early October but we start preparing for Halloween in late September at our house! Over the years I've collected nearly as much Halloween decorations as Christmas decorations. My birthday is just a few days shy of Halloween so I looked forward to my combined birthday/Halloween Party every year. Costumes, bobbling for apples and caramel corn was always present. This is the recipe I make each year for my family. It's addictive! In a saucepan mix, butter, syrup, brown sugar and salt. Bring to a boil, stirring occasionally. Boil for five minutes and remove from heat. Stir in vanilla and baking soda. 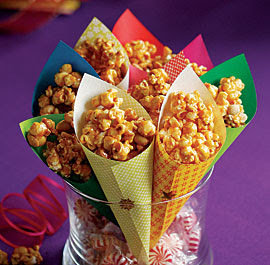 In two large roasting pans fold in the popcorn till covered with sauce. Mix in Reece's Pieces. Bake at 200 for 20 minutes. Cool for ten minutes and stir gently. Remove from pans on wax paper and cool completely. Store in Ziploc bags or airtight containers.